A land of beautiful landscapes, diverse people and their mesmerizing cultures, India is often cited among the world’s most beautiful countries. We all are aware of our country’s allure and how its beauty alters with the change of every season. So, we bring you 13 photographs of incredible India from up above the sky! Does it not look like an abstract painting straight out of the expressionistic school? This image was taken in 2014, and the picturesque landscape of the metropolis is simply extraordinary. 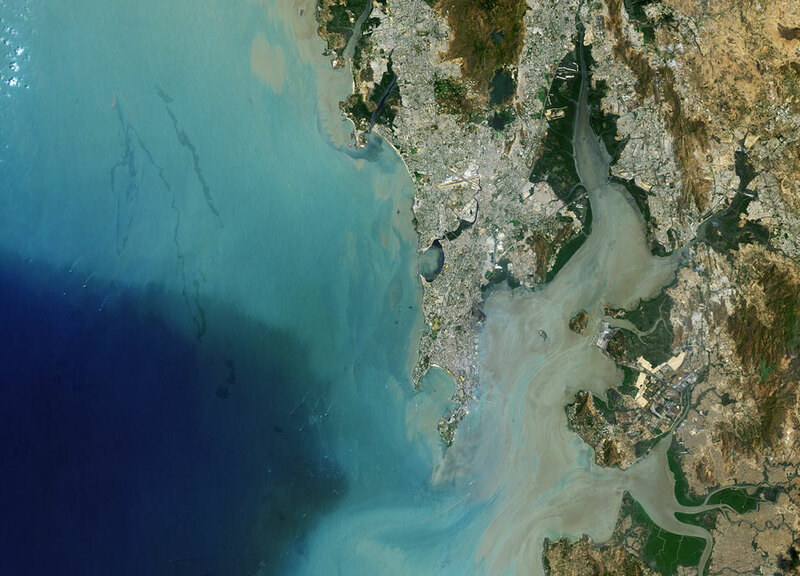 Being the best natural harbor in India one can see some ships along the coastline, EVEN FROM SPACE! Numerous ships are visible in the sea, some of them approaching the city. 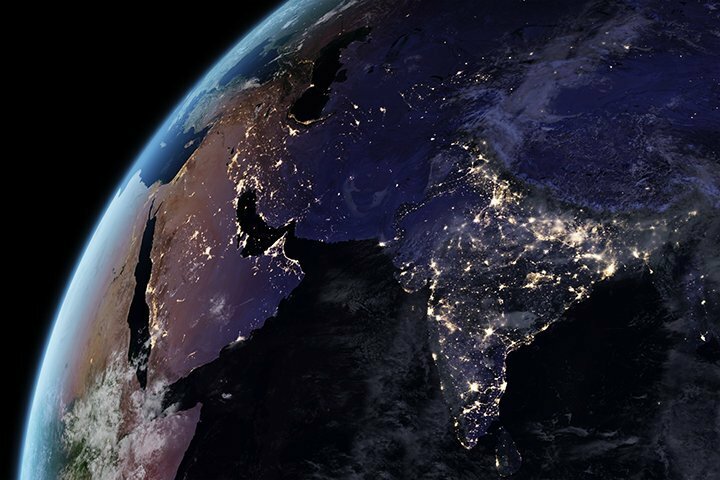 The Silicon Valley Of India covered in a blanket of lights at night is a serene visual treat. Thomas Pesquet’s photograph has captured the essence of the city. This photograph of Bengaluru is a fine example of how this city is one of the best in India, even when viewed from space. The National Capital, the heart of the nation as seen from space. The photograph has captured the essence and beauty of the city at night. This ancient city is the birthplace of everything that we call the new India today. The golden lights look like molten gold splattered over the goldsmith’s desk, just like how the city is one that is forged out of metaphorical gold. This surreal photo of the Himalayas and Delhi lit in the silver luster of moonlight is another example of how northern India is truly a valley of diversity and the zenith of natural beauty. The photograph was taken by astronaut Tim Peake in 2016. It looks like something straight out of a sci-fi novel or a movie. The city with a heart truly shines like a heart in the darkness around it. Kolkata, the birthplace of the literary renaissance in India and the former capital of the country shines like a city lost in time. This stunning city has captured the true meaning of what it means to be Indian in its truest sense, as it has been the biggest cultural hub for ages. Its two sides are dissected by the Hoogly River and have been captured in this image by Chris Hadfield in 2013. 6. This is a long exposure shot of Northern India from the International Space Station. A long exposure shot of northern India taken from the International Space Station taken in January 2016 captures the exquisiteness of the region shrouded in patches of clouds at night. The cities of northern India and Pakistan light up the night sky with an unparalleled vigor as darkness prevailed over the region and engulfed everything within its reach. This is another long exposure image of the region from a different angle, the most populous cities of the region are visible, Delhi, Srinagar, Islamabad, and Lahore are the most prominent. While many other cities form an interconnected network of lights and illuminate the sky. The Copernicus Sentinel-2A captured this surreal image of the Rann of Kutch in 2015. The salt flats have a magical charm about them and their incomparable scenic beauty could not even escape the lens of a satellite in space. The Rann is one of the largest salt deserts in the world and in the image we can see the salt evaporation ponds spread across the salt marsh. The western most coast of the country where two gulfs lie, the Gulf of Kachchh and the Gulf of Khambat. This image was captured by Tim Peake while approaching towards Ahmedabad. The state of Gujarat is illuminated with the lights in the night. The Copernicus Sentinel-2A satellite’s false color image of the Thar desert and the city of Bikaner is a spectacular visual treat, though the colors may not be real in the image yet the image is a striking one, with hues of red and brown it captures the beauty of the Thar and the cities in it. The Gangetic Delta, the world’s largest delta shared between Bangladesh and India, as imaged by Proba-V. The image shows the humongous size of this delta with its unmatched beauty, the density of flora and diversity of fauna it is one of the most pristine and complex ecosystems in all of the Indian Sub-continent. 12. This image ESA clearly shows the Himalayas, Delhi on the left with Yamuna river and Ganges a little right to it. The Gangetic plains, the most fertile region in the world and the Himalayas captured in a single frame of this MERIS (Medium Resolution Imaging Spectrometer) false color image spectacularly shows the geographic contrast between the snow covered mountain tops of plains which lie side by side cradling the Indo-Gangetic River system. 13. At last, we bring you the nation itself. As glistening as ever! There are so many fake images that flood message inboxes during Diwali which claim to be images of India. From Space celebrating Diwali, released by NASA and other space research organizations of the sort. Stay away from such hoaxes and feel free to share one of these images, not on Diwali, but generally.